Greetings, dear readers! I hope this post finds you well because we're about to talk about something less than pleasant: pain. Have you ever just hurt so badly and felt exhausted? Have your brain feel like it's in a fog? 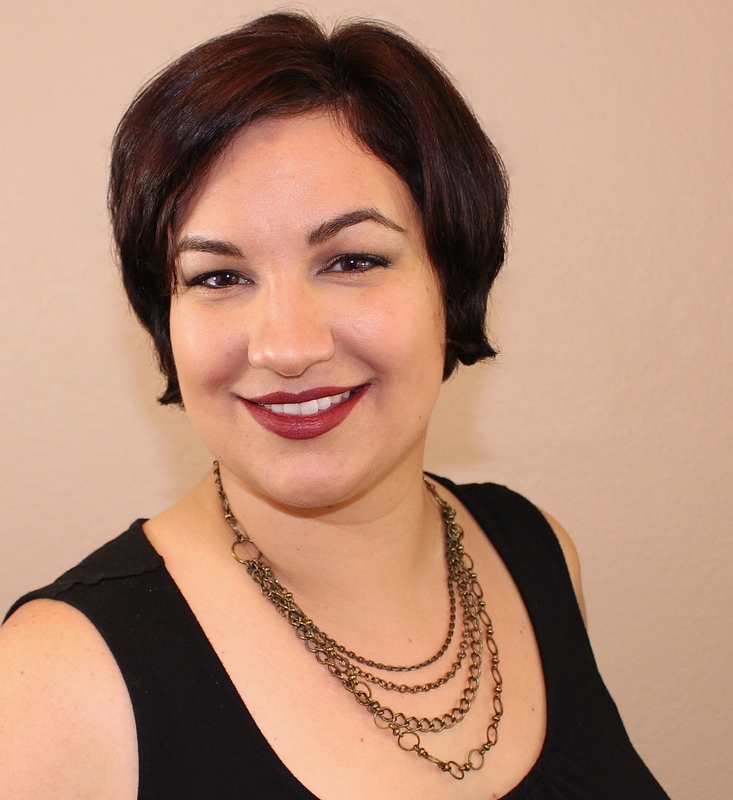 I experience all those on occasion, and I know that ninety nine percent of the time it has something to do with my kids jumping on me, not sleeping, or just insisting on being held (and they are HEAVY). In my case, the solutions are relatively easy to deal with, and I know the situation is temporary. But what about those people who experience this every day and there is no real answer to making it stop? If you're not familiar with which I speak, this post is about fibromyalgia, or specifically, a fundraiser to raise awareness on this invisible illness. I do not have fibromyalgia, but I do have an invisible illness. I know the judgement others in similar situations face when you have to take a raincheck on activities because you just are incapable that day and not fully functional. I how it feels to be yelled out when you legally park in a handicap space because you aren't in a wheelchair or some other obvious handicap. Having an invisible illness is not easy, and the polish and vinyls set in this post will hopefully help to raise awareness and help those that suffer. The Office on Women's Health estimates that as many as 5 million Americans over the age of 18 are affected by fibromyalgia alone. With so many people affected, it certainly merits more attention! To help spread the word about the condition and raise funds, Tiffany from Polish and Paws worked with Laura from Ellagee Polish and Kristi from Ribbits Stickits to create a limited edition fundraising set. For every set sold, $6 will be donated to the National Fibromyalgia Association, an organization that provides support, education, research, and advocacy for fibromyalgia and chronic pain conditions. Each limited edition set will include Fibro Warrior by Ellagee Polish and 10 purple ribbon nail vinyl stickers from Ribbits Stickits. Fibro Warrior is a red violet polish with flakes in shades of copper and gold, a lovely subtle holo shimmer, and a strong pink flash. It arrives in a special edition bottle that contains a large purple awareness ribbon on one side and a purple ribbon on the Ellagee Polish box (not pictured). While the base is thicker than the average mainstream nail polish, it is on par with many other indie brands and my personal preference for application. This polish glides on smoothly for an even finish from the first coat, and I had no issues with the flakes sticking up or adding texture to my nails. I used two coats plus top coat for the photos above. This polish is densely pigmented, and while I used two coats, those that tend to apply with a heavier hand may find they only need one coat for opacity. Because of this density, it can be overworked and leave a slightly uneven appearance if you don't work reasonably quickly and commit to your brush strokes. I really wanted the ribbons to pop on my nails so instead of using the nail vinyls as stickers and adding top coat, I used them as stencils on my nails with a black creme polish. The vinyls are really sticky, so if you opt to go this route, which allows more flexibility for colours, you'll need to quickly stick and unstick the sticky side on the back of your hand a couple times before laying them down on your nails. If you want to apply as stickers, this step isn't necessary. Just place and add top coat to seal them in. I used matte top coat for these photos shown above to make the flakes pop against the base shade. 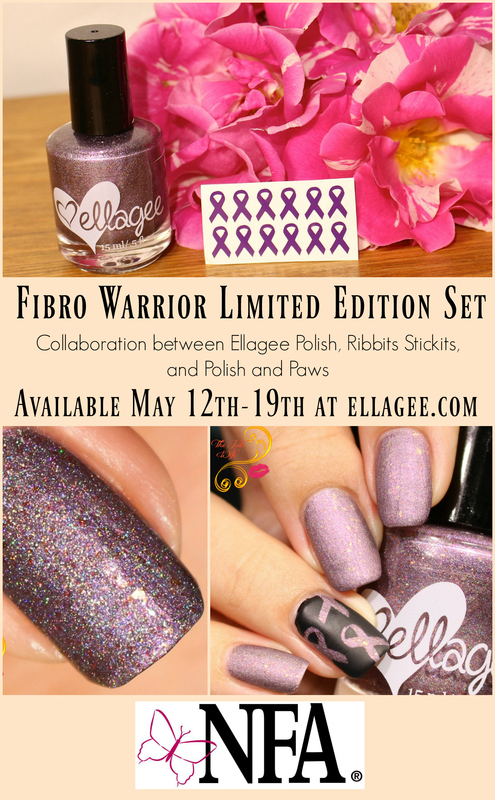 The Fibro Warrior Limited Edition set will retail for $12 at Ellagee Polish. It will be available for preorder starting May 12th, on Fibromyalgia Awareness Day, and continue through May 19th. Shipping will begin on or before May 29th. 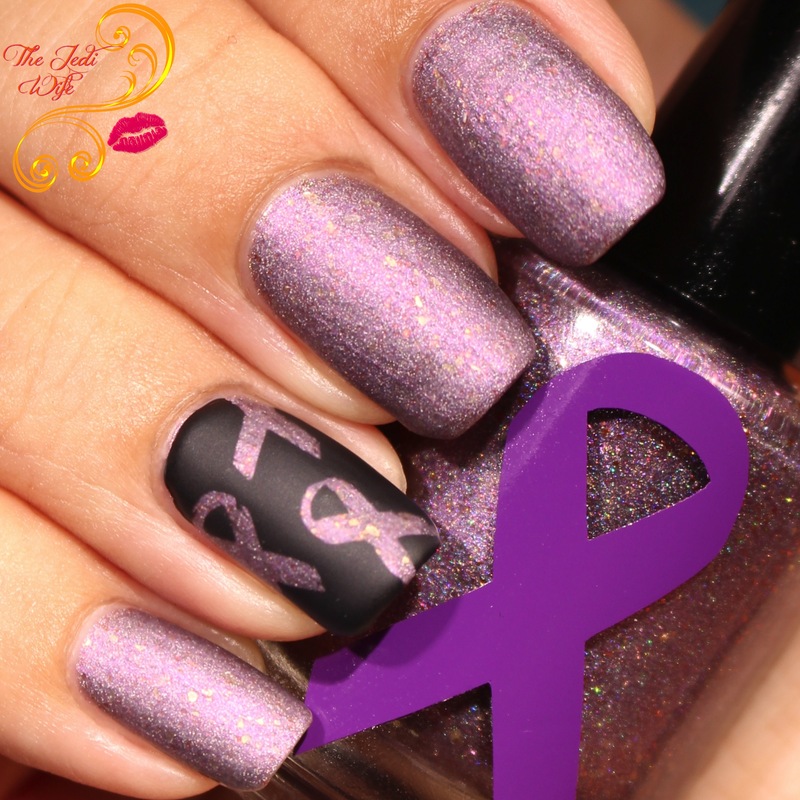 Not only will you have a beautiful polish for your nails with awareness ribbon nail art, your purchase can help those that are affected with this condition. I hope you consider picking up this limited edition set when it becomes available for preorder on Friday! Thank you so much Jen! Gorgeous swatches and great review! I have Fibro. Thank you for your part in bringing awareness to this very difficult ailment. I love that she's doing this. I was diagnosed years ago but I've just accepted it as "This is how my life is" and don't mess with medicines. I have to take extra naps, and sometimes I just don't have the energy to do things but thankfully my fibro is much less serious that others. Great color and I love that it's only 2 coats, possibly a one coat for the heavy handed! Beautiful polish for a great cause! A beautiful polish for a great cause! I love that you matted it. Beautiful swatches. This is a great collaboration towards a great cause. This is a lovely polish for such a great cause. I hope they are able to donate a lot of money! Ive never seen someone get yelled at for parking in a handicap space before, whether they're in a wheelchair or not but it doesn't surprise me. People can be some rude!